This past Sunday I had the opportunity to go to a Young Nail's class on how to properly use an e-file (drill). Years ago e-filing was a pretty debated issue -mostly because you'd have uneducated nail techs doing things with an e-file that you should never do. Recently e-files have become pretty standard in most salons because of the fact that with education they've become safer to use and that they drastically cut down on techs getting carpal tunnel in their hands and wrists. Huuuuuge plus there if you ask me. 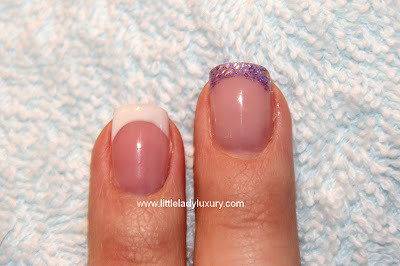 The class ended up covering how to drill on both acrylic and gel nails (yes, there is a difference). I'm not really going to go into that, I just wanted to give you guys a peak at the demo nails they did on me. I was one of only 2 girls wearing gel nails, so I got to be the demo girl. 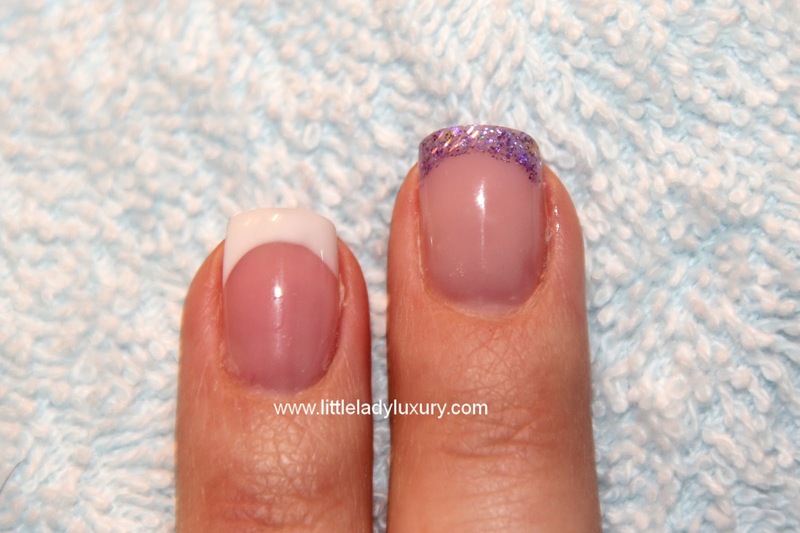 I was wearing my blue snowflake gels that I showed you a few posts ago, and she switched one nail out to be a pink and white nail, and another to have a purple glitter french tip. Now let me tell you, there's nothing better than being a demo girl because you get a front row seat into how to do everything, and I pretty much fell in love with YN's gel line... which you'll see in an upcoming post because I bought it and have been playing around with it ever since! Anyway, here's the pics from the class. The first picture is my nails before the demo, and then the second and third pictures are the finished products that the Young Nails Mentor Heather did - which required drilling off all my pretty glitter and building a new nail from scratch. Hope you like it!